The Celebrity Chef Reviews The Ministry of Food. 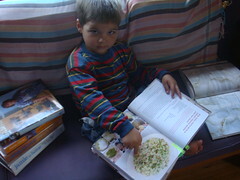 So the Celebrity Chef had a great week, a friend lent him a whole pile of books by his best (chef) friend: James. 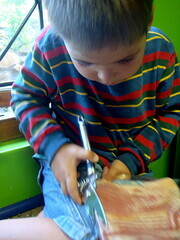 He has spent hours pouring through these books. 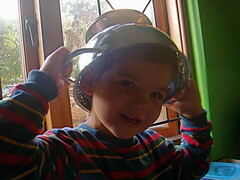 Yes he really is passionate about this whole cooking thing! When I first flipped through the book I thought the recipes looked really hard, but I was misled by excellent food presentation! 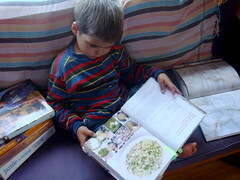 Just get reading, the recipes are really really simple and you build them up to make them look better and better. The ingredients are all readily available – we had most of them before we even began (maybe not the prawns and the creme fraiche!). The recipe format is brilliant, you don’t have to read through lists of ingredients just read the recipe and the ingredients are printed in red – brilliant, you can see at a glance if you have the ingredients – but can also just focus on the recipe and get cooking straight away. 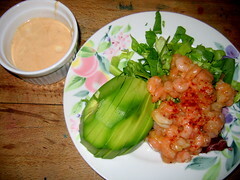 Prawns and Avocado with an Old-School Marie Rose Sauce – loved this grown-up looking recipe. 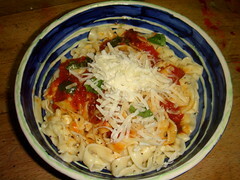 Classic Tomato Spaghetti – we used fresh tagliatelle, because it was Tuesday and that’s our fresh pasta day. 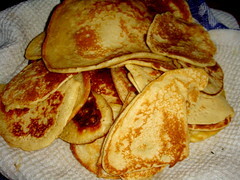 Such an easy recipe, yummy. 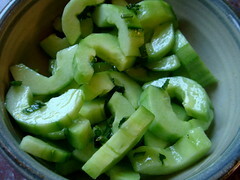 Evolution Cucumber Salad – we loved the evolution salads and the jam jar dressings! 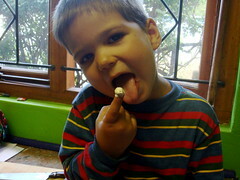 – the reason this is such a small little tiny serving is that 90% of it was eaten before it got to the table. 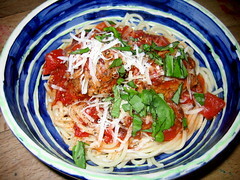 Meatballs and Pasta – these were yummy, never tried meatballs before and now they are on our list of foods we all eat. Perfect Roast Pork – We made this for dinner-with-granny and forgot to photograph it in the rush to eat it. Even she was way impressed. 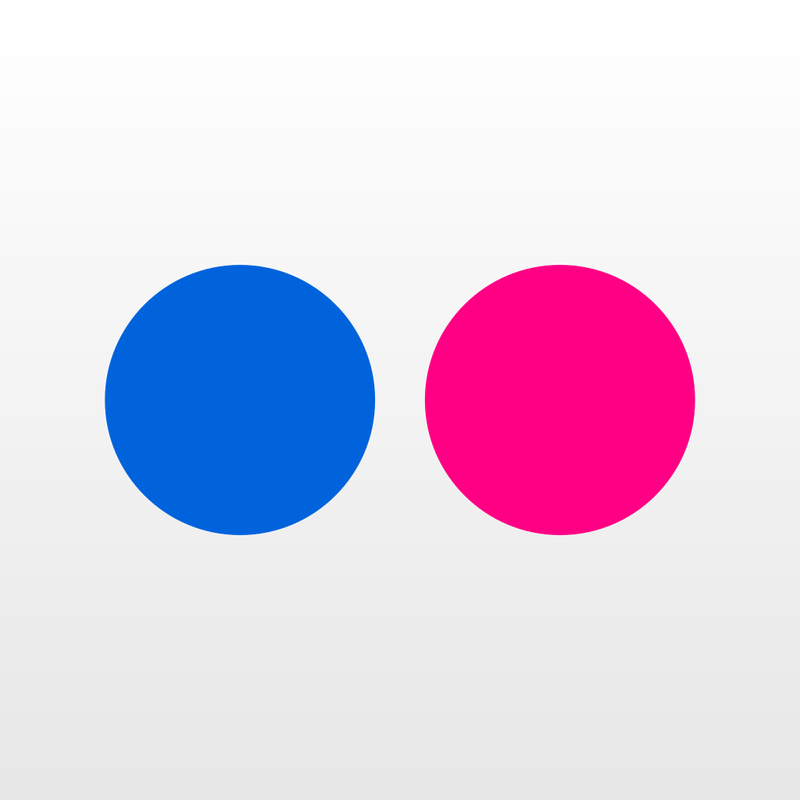 One Cup Pancakes – we made a double batch, I new we would need them. 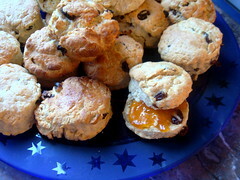 Fruit Scones – we had these for breakfast, I left off the clotted cream, not something that I keep in stock (hmmm – pity!). Even the most discerning (read fussy raisin loathers) guzzled these down. 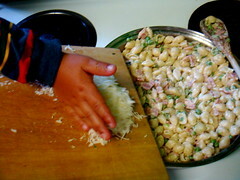 Mini Shell Pasta With A Creamy Smoked Bacon And Pea Sauce. 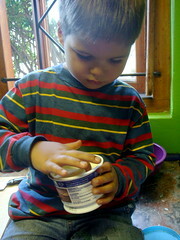 And shared the delights with Hood #6. 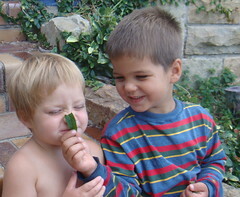 Leave the pasta to the mother person and get on with the sauce… Getting the bacon out the pack can be jolly tricky. 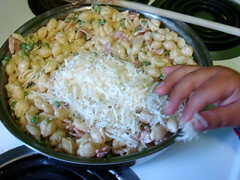 Once the bacon is done, toss in the peas, stir them through. So what is the creme fraiche anyway? This is so good, just toss the whole tub in. Toss in the mint and lemon juice. 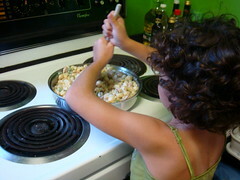 And then the pasta shells… and call in a big sister to stir. Toss in the Parmesan, any recipe with Parmesan is a good one! We never took a finished photo, this huge pan of pasta didn’t even bounce off the plates, it was inhaled before it reached the table. 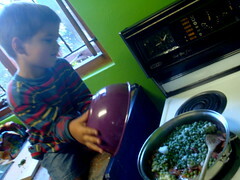 Even my anti-pea man gave it a thumbs up – bacon can do that to a recipe. Here is the brilliant thing about this book – there is a fantastic website – with recipes to try (including this one), and all sorts of goodies from the book – just wonderful! There are so many things we still have to explore in this book – stews, salsas, sauces, fish, omelettes, desserts. Thanks again Jamie Oliver for a fabulous book. Next Se7en Revive The Art of Letter Writing.